I've been pretty busy since early summer, spending most of my spare time recording a video course about features for debugging and testing in Visual Studio 2017. Since Monday, the first part of this video course is finally available to everyone. 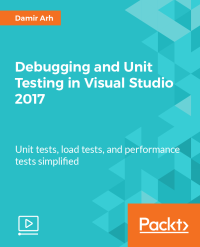 It covers live debugging and all aspects of unit testing, including continuous testing with Live Unit Testing and white-box testing with IntelliTest. Check my dedicated page for the course to learn more about the contents. If you're programming in C# and would like to make better use of Visual Studio during debugging and unit testing, this might be the video for you. It's quite an exhaustive tour of available features, applied to practical examples. Don't expect it to dive too deep into individual topics, though. The goal was to get you going and show you what is available. You can always continue with additional specialized resources if you want to learn all the details about a specific feature of interest. You can buy the video from Packt Publishing or watch it as a part of Mapt subscription.